I wanted to post a selection of elements that I used in my latest ball machine metropolis. I can't post all of them with step by step instructions. But you should be able to make most parts by looking at the pictures in this instructable. Feel free to comment, criticize or ask anything. Thanks for looking and have fun building! If you haven't seen Metropolis, go to this link for the slideshow. > When you make the path wider, the ball gets more speed. I modified this from another instructable. The ball will enter the basket, spin 300° and then drops out of the basket onto the next path. Credits for the idea go to "yardking"
This basket releases five balls at once. You can adjust the weight by adding or removing wheels. When installed correctly this can be used to allow balls to pass one by one. These stairs make a rattling sound. Version one is with white rods and version two with blue rods. Spinning objects that can be used inside a support tower. This is my favorite part of metropolis, the zigzag! In the video it is used in path 11 at 9:20. When you make this, make sure the ball has some speed before it enters the zigzag. Otherwise it will not tip over. I used this to catch the ball after the zigzag element. This half pipe doesn't use a mechanism that drops the ball when it reaches the bottom, so it can be used in very narrow spaces. A double spiral with a thick red edge. 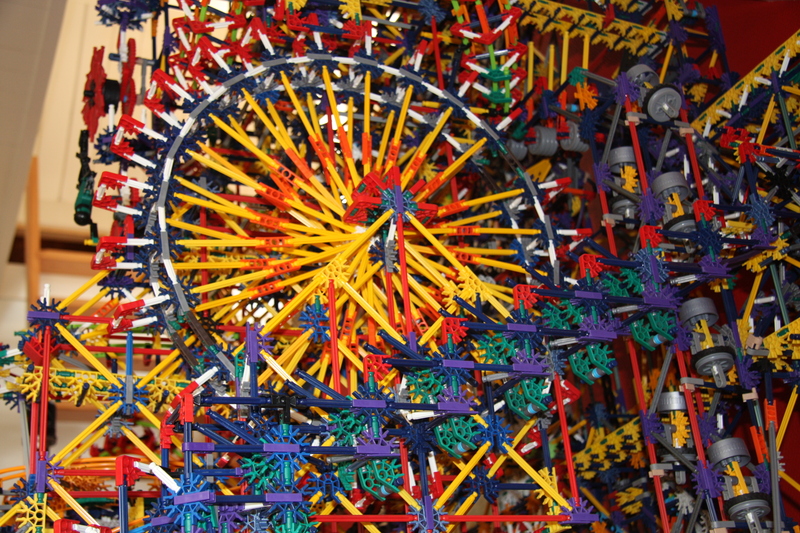 The center pieces are connected with an Y-connector (knex man hand). It is very heavy and needs to be supported well enough. A path made with flexible rods. You can also use normal rods for straight bits. It's quite fragile so make sure you support it enough! A fully customizable rollercoasterish path, you can make pretty much every kind of shape with this. It's also very sturdy, the ball rolls very well and that's what makes this path also very fast! The lift consists of wheels that have four long arms on it. I used one 12 Volt motor for two wheels. And connected the two wheels with a long chain. Right after you have made the wheels, it is time to install them in the tower. You can put a motor directly on the main axle of the wheel, or connect multiple wheels together with a chain like I did. And then put a motor on the chain. I have cut the instructions for the wheel lift in three parts. The base, middle part and top part. You can make this lift as high as you want, and as fast as you want. But keep in mind that if you make it higher and faster, it will probably slow down when it carries over 3-4 balls at the same time. The base is designed so that that the lift picks up balls one by one. Make it as high as you want. You can add the motor later on (I would put it somewhere in the middle). The orange track connecters can be replaced by yellow ones, depending on your choice of track you want to use. By making the corner very sturdy and adding an inclined plane, the ball will bounce against the plane and retain its speed! For the mill/wheel lift, can the yellow gears be replaced with red gears? Since 2011, ball halves have gone up 3 cents!!! And that's in 3 years! Imagine what it will be like in 10 years!! It'd be awesome if you made a step by step instruction on how you made each piece and then put it all together. Hell...I'd pay for it. Thank you immensely for the credit! can you post the big ferris wheel?? There are a total of six white connectors in the center of it. he ik ben ook nederlands. heb jij fotos van het platform ? Do you know if it works with the Black/White balls?